DESCRIPTION: Romney's renown as a portraitist of socially-elite individuals is well documented by his sitter books, which survive for the years 1776 to 1795. 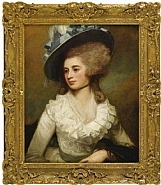 It is possible that this painting of Lady Caroline Price dates to this period, or shortly before it, as the sitter love Sir Uvedale Price in 1774. The youngest daughter of George Carpenter, First Earl of Tyrconnell, Lady Caroline Carpenter was born in 1755. Her husband was a prominent writer and landscape designer who was one of the chief aestheticians of the Picturesque movement in landscape design. Lord and Lady Price hosted distinguished parties at their Foxley home, entertaining such luminaries as Sheridan, Charles James Fox, Samuel Rogers, and Wordsworth. Along with Sir Joshua Reynolds, George Romney was one of the most prominent portraitists of the eighteenth century. His paintings such as the present work are characterized by fashionable costume, beautiful color, and graceful brushwork. Sitting with a sense of poise befitting her stature, Lady Price modestly averts her gaze to her right. Her white ruffled bodice is quickly and expertly described with masterful brushstrokes. Light pours into the space, playing off of the rich texture of the lady's plumed, blue ribbon hat. LITERATURE: Thomas Humphry Ward and W. Roberts, Romney: A Biographical and Critical Essay with a catalogue raisonné of his works, vol. 2 (London, 1904), p. 127. Hilda Gamlin, George Romney and His Art (London, 1894), p. 107. Sir Herbert Maxwell, George Romney (London, 1902), p. 187, no. 319. George Paston, George Romney (London, 1903), p. 197. 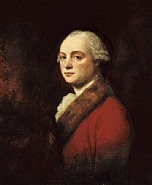 Lord Ronald Sutherland Gower, George Romney (London, 1904), p. 124, no. 319. EXHIBITION HISTORY: Royal Academy, London, 'Old Masters Exhibition', 1891, no. 27.